PALM DESERT, CA -- It's not exactly the place you'd figure to look for it, but there's a little bit of Australia found in Palm Desert, California -- and we're not just talking about seeing kangaroos at the zoo, or chomping on a Bloomin' Onion at the Outback Steakhouse off of Highway 111. 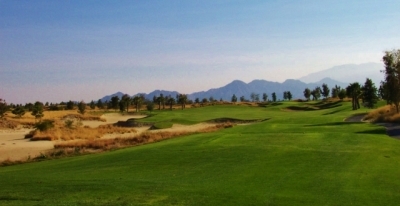 Native grasses and beautiful mountain views await you on the 14th hole at Shadow Ridge. That's because a slice of Australia's now located at the Marriott Shadow Ridge Resort, host to the Palm Springs area's only Nick Faldo designed golf course. 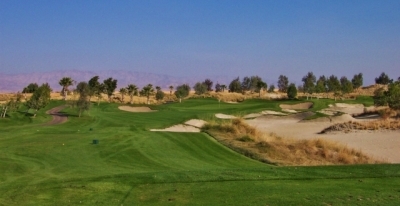 The layout opened in December, 2000, and features something unique to the low desert as well as the entire United States, namely a course inspired by Faldo. Faldo set out to design something distinctly different at Shadow Ridge -- and by mixing in some Australian influences, he's accomplished his goal. 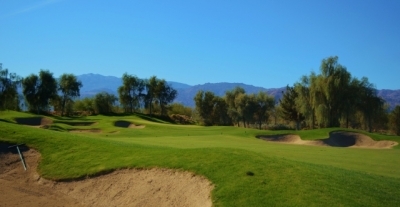 Shadow Ridge joins a number of high quality tracks in the immediate area, including Desert Willow Golf Resort (across the street), and the Marriott Desert Springs Resort, just a few blocks away. 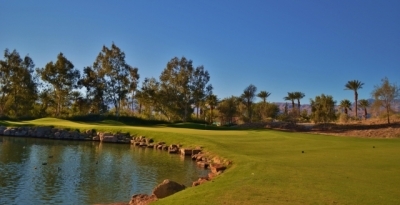 Each provides a different golf experience in a resort setting -- Desert Willow featuring the natural desert flora & fauna, and Desert Springs offering the late Ted Robinson's incredible waterscaping talents. But having seen and played the aforementioned courses several times, it was still somewhat surprising to glimpse Faldo's re-working of the desert landscape into something you just won't find anywhere else in this neck-of-the-desert. 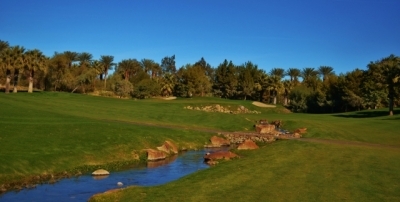 Brett Meabon, Shadow Ridge's Head Golf Professional, explains: "A lot of courses in the desert either incorporate the natural desert vegetation into the golf course, or completely turn the place into a plush carpeted 'oasis' of grass & palm trees. Faldo didn't really do either on our course. He's designed sort of a desert style layout with a links-style feel, incorporating native grasses and heather that you're more likely to find in Europe or on a seaside links-style course." 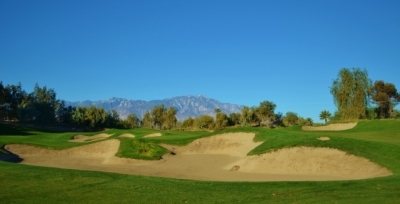 Forced carries aren't typically a problem at Shadow Ridge, but the large fairway bunkers demand accurate placement. Here, the par four 8th hole. Or, as Faldo explains, what you'll see on some noteworthy Australian layouts: "If there is a particular inspiration for Shadow Ridge, then I would say we set out to effect a flavor of the great sand-belt courses of Australia, notably Kingston Heath and Royal Melbourne." Guessing that 99% (myself included) of Shadow Ridge's clientele have never experienced the Faldo referenced golf courses, we'll take him at his word that this is what those Australian links looks like. Meabon's description also seems to work, as well. For those whose closest association with the land 'down under' is a frosty mug of Foster's beer (which for North American consumption, is mostly brewed in Canada), Meabon's 'links-style' label helps us place Shadow Ridge in its proper perspective. The par three 12th hole looks like it is framed by sand, but there is actually quite a bit of green to aim for. The first thing you'll notice is Faldo's dramatic use of bunkering, often bordered by very 'links-style' type grasses. If you get beyond the sand, you'll see quite a bit of green grass to place shots, especially off the tee. As you'd expect from an old-country style design, the hazards and bunkers suggest the shot to hit -- often with a risk-reward element to sweeten the deal. 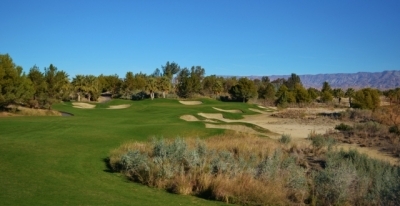 Visually, Shadow Ridge is distinctive from its desert golf course siblings. Most of the more difficult desert courses are target in nature, with a blend of water, desert scrub and waste areas providing often-lethal punishment for failure to execute. Shadow Ridge certainly has the water you'll see on many upscale desert resort layouts, but the playing areas are exceptionally wide. If you stay dry, you shouldn't have a problem keeping the ball in play -- and the surfaces are exquisitely maintained, so you'll enjoy the conditions. But as suggested above, finding your ball is barely half the battle. Meabon elaborates: "The difficulty in this course is around the greens. Faldo wanted to include a generous amount of room off the tee, but then challenge people in the short game. He's really put in some bold bunkering, as well as shaved collection areas around the greens -- that's the defining characteristic of the course that makes it challenging and unique." "Then once you reach the greens, there're lots of undulations and character in them, with plenty of spots where you'll regret hitting it there. The course's yardage (7006 from the back tees) is long enough to keep big hitters honest, but decent ball strikers can certainly negotiate around it. All in all, it's the short game where you'll need to play well in order to score here," Meabon said. Water guards the entire left side of the par four 9th hole. Faldo puts it in similar terms: "Our fairways are typically generous, but our bunkering style is impressively bold. The greens have plenty of subtle undulations and they reward and encourage a variety of approach shots. Miss the putting surfaces here and your ball will invariably roll into a tightly-mown collection area -- recovering from which will require a deft touch -- or into a greenside bunker." A deft touch indeed. A playing partner of ours had such an incredibly awkward stance in a greenside trap on the second hole that he nearly fell over after moving the ball a couple inches. On most courses, hitting into the sand is a penalty -- but at Shadow Ridge, it's sometimes a punishment. Lay-up to the left off the tee of the 342 yard, par four 3rd hole. You'll also encounter some mild elevation changes. A few of the desert's 'canyon' courses offer ups and downs worthy of the finest mountain layouts. Shadow Ridge isn't in their league, but it's not nearly as flat as you'd expect (based on the surrounding terrain), which adds another challenging aspect to a round on the course. As an example, the 7th hole plays 218 yards from the back tees, but you're also firing up a considerable slope to reach the putting surface. You'd better pay attention to the cart's GPS for pin location, because you don't want to miss in the wrong spot, either. Should you desire an extended stay at Marriott's Shadow Ridge, the Faldo Golf Institute will help you acquire the 'deft touch' the designer suggests is required to hit the smallish shots on his course. "The Faldo Institute's got three main instructors offering several different programs -- a 3-day school, a weekend school, full swing sessions and short-game sessions, as well as one-hour private lessons. Nick Faldo designed the instructional programs, which incorporate his philosophies on the game. And we've got an unbelievable practice facility to serve as the 'classroom' -- with a dual ended range and several short game practice areas and putting greens," Meabon says proudly. Multiple options off the tee of the dogleg left, short par four 13th hole. A final note before describing some of the holes -- the service you'll receive at Shadow Ridge is requisite with the Marriott name. Meabon says, "It's the Marriott philosophy -- that with our staff and customer service, we certainly want those things to be a big part of your day here. I want our guests to feel like they've been made a priority from the time they arrive to the time they leave." Your day on the course starts with a relatively mild, 397 yard par four, dead straight with a generous amount of room to hit the fairway. 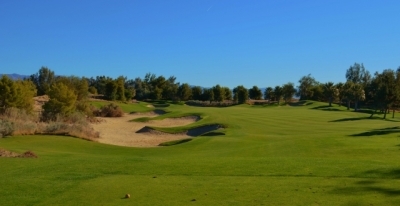 Upon arriving at the first green, you'll receive your initial introduction to the undulations and chipping challenges you'll encounter throughout at Shadow Ridge. Faldo's success with closely cut grass around the severe slopes of Augusta National certainly appears to influence his thinking here -- as you'll be able to choose between putting, flopping, bump and run or chipping if you're off the green. The greens speeds were average to above average. If you're short, you're wet on the beautiful par three 17th hole. Three is a terrific short par four -- 342 yards from the back tees, with several options clearly presented for club selection. Very long hitters might have a go at placing the ball close to the green, but they'll have to clear bunkers guarding the straight approach, and cavernous bunkers protecting the elevated putting surface. A perfect example of a challenging hole where you might get a stroke back -- but also could very easily give one up, too. Another thing Faldo's known for is a quirky sense of humor, and that's never been more aptly demonstrated than with the sixth hole -- a 489 yard par four. Our local playing partner says it often plays into the wind, too. There isn't a great deal of trouble on the hole -- other than it's oceanic sized length, but needless to say, par feels like a birdie here. Nine is a great finishing hole for the outward nine, complete with lake and waterfall. Very beautiful. There is trouble from tee to green on the challenging par four 18th hole. The back nine starts with another marathon trek, the 463 yard 10th hole. Water guards the right side of the tee shot, but this slight dogleg right begs you to try and cut off some distance from the tee ball, or face a possible fairway metal length approach. This green is wide open -- but don't miss long, or you might just find yourself chipping downhill off a severe slope. Thirteen is another excellent short par four, 345 yards in length. For those who can hit the drive long and straight, you'll have a half wedge left to the green, which doglegs sharply left from the fairway landing area. But if you're slightly right or left off the tee, you'll probably have an awkward angle to approach this long and narrow green, protected by grassy slopes and deep bunkers. Meabon says eighteen is one of, if not the toughest hole on the course. Here's why: "It's really narrow, with a creek winding down the left side of the fairway off the tee, and the right side is lined with bunkers as well as the villas -- so there's really a definite boundary that makes the tee shot intimidating. Then the creek winds back across the fairway and protects the right side on the second half of the hole. You'll need to hit a great drive, then a pretty solid approach shot to grab a final par on that one." It's the type of 'finishing flare' you'd expect from Faldo on a course he designs. Faldo's always been one of the foremost technicians in the game, and he'll demand precision, even from the average resort player on his layout at Shadow Ridge -- from start to finish. It's Faldo's version of an Aussie adventure, delivered right to the heart of the California desert. Rates include greens fees, cart, GPS, and range balls. Walking is not permitted.